If your business owns a resource that you just don’t know what to do with, try the free Valuing Natural Resource Template. 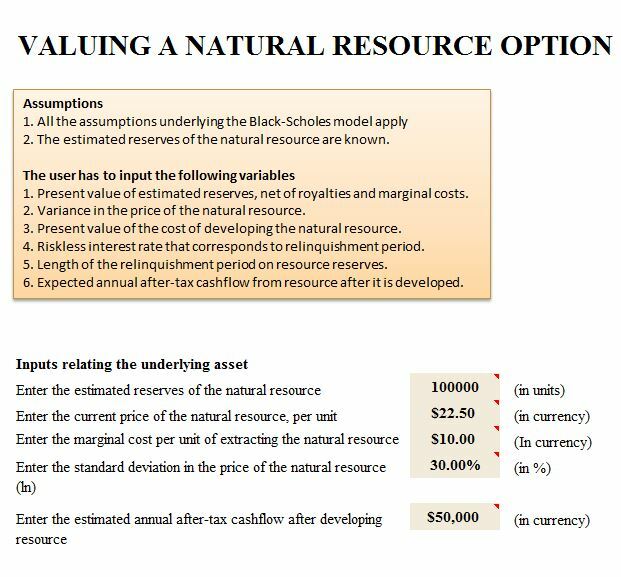 This document uses a model that can determine the option pricing to value a natural resource that your company owns, which is pretty useful for valuing oil or mining companies, as a few examples. Before spending the money on a professional evaluator, you can use this template for free to see if selling the resource is worth pursuing. Items like land, oil, water and even forest can be evaluated using this free template, which equates to money in your pocket. To use this free document today, just follow the guide conveniently provided for you below. You will first need to download the free template by clicking on the link at the bottom of this page. There will be several sections to enter values about your resource property. Just enter the corresponding information into the highlighted cells after each sentence. To replace the example information you will receive upon downloading the template, just click the cell you want to change and enter something else. You will need to enter the estimated reserves of the natural resource, the current price of the natural resource, per unit, the marginal cost per unit of extracting the natural resource, the standard deviation in the price of the natural resource (ln), and the estimated annual after-tax cash flow after developing the resource. The other items include developing costs and rights to the resource. Just fill out the cells as you see them filled out in the examples, but with your own information. At the very bottom of this template, you will see the long-term estimations for your resource property and be able to determine its value in the last cell of the document.